In most middle/large mining companies, power consumption of motor accounts for 50% of total power consumption. LV variable speed drive is very common. But, defectiveness of MV variable frequency technology, and voltage withstand capacity of components have been restricting MV variable speed drive development and its application. In recent years, with rapid development of MV technology and voltage withstand function, MV variable speed drive has been used widely. Its energy saving effect is considerable. There were 4 low voltage motors (315kW, 562A, 1476r/min) in flue gas purification system. In general, 2~3 motors worked and another was spare. Fans connected in parallel. Sub-pressure was controlled by valve. Valve opening was controlled just by personnel experience. In 2005, plant decided to reform purification system with medium voltage variable speed drive. Mode of one work and one spare was suggested to ensure safety and reliability. MV asynchronous motor: YP7560-6, 1000kW, 50Hz , Ve=6300V,Ie=108.95A; ne=994r/min; cosφ=0.876, insulation class: F, connecting: Y, allowed to start once in hot state and twice in cold state. Model: Y7-2X36-22F; 338600m3/h; 7500Pa; ne=990r/min; 1000kW. 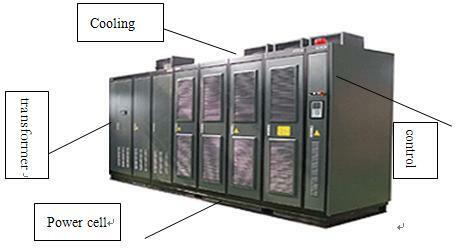 Gozuk variable speed drive adopts technology of cell-cascaded, high-medium voltage source, 6kV input. 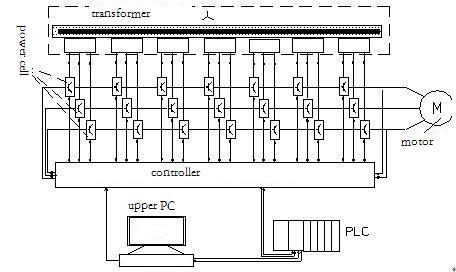 Medium voltage is transferred to low voltage through transformer. Then it goes through diode and IGBT inverter. Then cells cascaded output 6.3kV.